The image file must be undamaged. The image file must be created by the same device (camera or mobile phone). The picture must have the same resolution and should have been taken with the same settings. The picture should NOT be edited using a photo editor or similar. Place the corrupt or damaged JPEGs + sample file in one folder. The sample needs to be named to “sample.jpg”. Work on copies of the corrupt JPEG photos! Select the drive containing the copies of the corrupt photos. Browse to the folder containing the copies of the corrupt photos. If you have for example copied them to a folder on your desktop, you typically select the C: drive > Users > Your username > Desktop > and then the Folder. Hint: To estimate the condition of the files, select the first few one-by-one. See below how to use and interpret entropy info and the byte histogram for estimating the chance for repair. Click “Repair”. JPG-Repair will process all selected files. JPG-Repair fails to repair the JPEG, why? Entropy too low/high: The data inside the file is likely not JPEG data or too much JPEG data is missing. 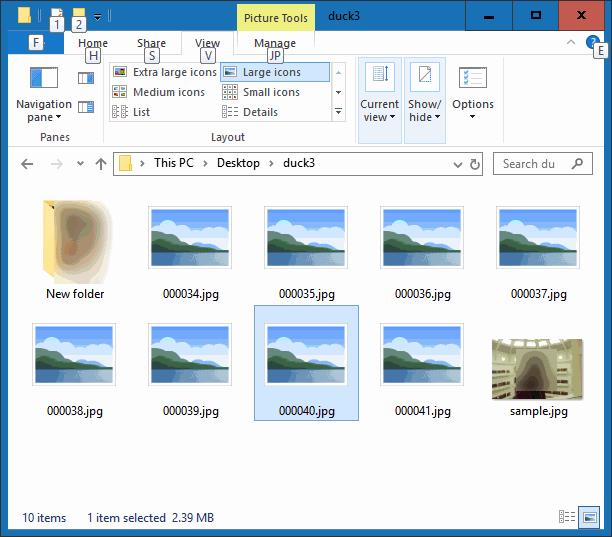 Windows Explorer fails to show thumbnail previews. 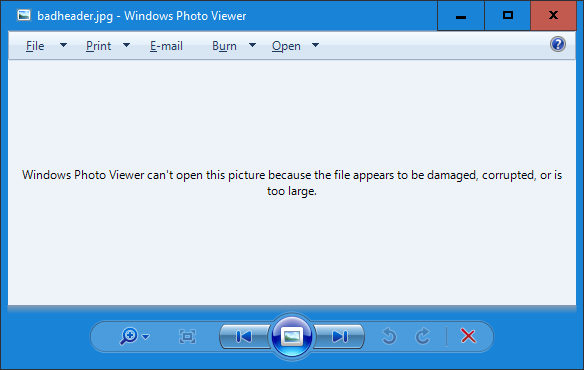 Windows Image viewer fails to open the file: “Can’t open this picture because the file appears to be damaged, corrupted, or is too large”. Windows Photos fails to open the photo: “It looks like we don’t support this file format”. If the header of a JPEG file is corrupt, in general you will not be able to open the file at all.